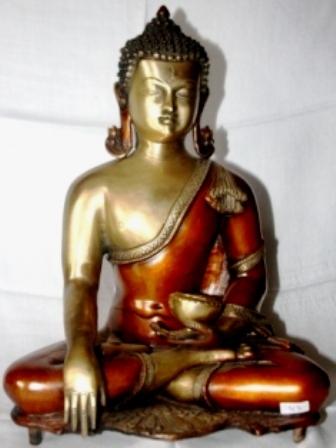 BUY SITTING BUDDHA, 16 INCHES GAUTAMA BUDDHA IDOL IN EXQUISITE 2 TONE HAND CRAFTED BRASS. 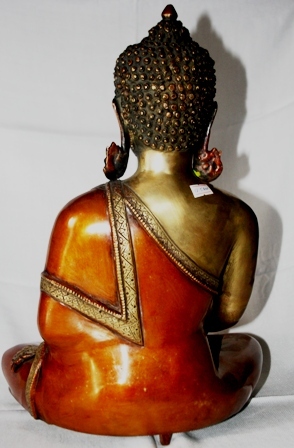 Buy Sitting Buddha Statue in 16 inches Brass Cast, handcrafted at Buddha Bazaar by our local artists. The monastic garbs are in a beautiful red tone and the Buddha holds the Vase of Alms in his hand which signifies the humility of a wandering Sage. Height: 16 inches, Length: 10 inches. Like the information on our Shakyamuni Buddha Statue, visit us here for more information on Buddhism.